Tom VanHaaren interviews incoming freshman defensive end Matt Godin. 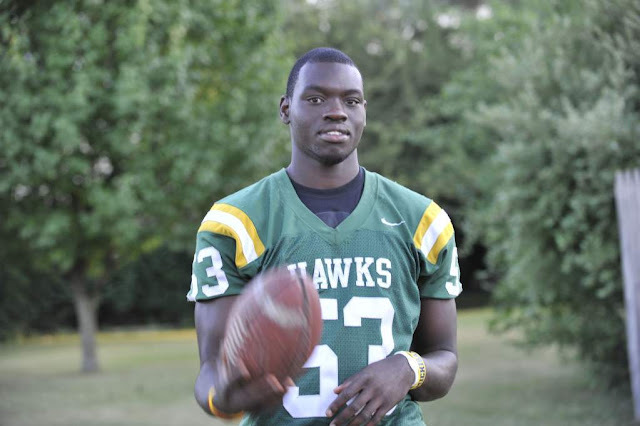 Last year: Ojemudia was in high school. He had 80 tackles, 19 tackles for loss, 16 sacks, 1 fumble recovery, and 1 blocked punt. When Ojemudia originally was offered and committed to Michigan, I was a little bit leery of him. People claimed that he was unblockable, but what I saw on film was that nobody really tried. For a powerhouse team like Harrison that has good players at just about every position, sometimes it's easy for decent players to play great. The biggest saving grace for Ojemudia, to me, was that Michigan's three defensive line coaches - especially Greg Mattison - thought he was a player. I don't trust the coaches on everyone, but defensive line recruiting shouldn't be an issue while he's at Michigan. Ojemudia played a lot of defensive tackle in high school, so working at defensive end is going to take an adjustment. When he played as a stand-up defensive end in the Semper Fidelis All-American Game, he struggled to get off the ball quickly. It's a completely different technique from what he played for the past couple seasons. But Michigan's coaches have shown a willingness to rotate defensive linemen liberally, which is why three guys played meaningful snaps at weakside end last season (Craig Roh, Jibreel Black, and Frank Clark). With Roh and Black changing positions to strongside end and 3-tech defensive tackle, respectively, that leaves Clark and SAM-turned-WDE Brennen Beyer to fight for snaps. Ojemudia's size at this point might prevent him from being useful on running downs, but his motor and pass rushing ability could make him a valuable third-and-long commodity. Tom VanHaaren interviews incoming freshman defensive end Tom Strobel. If you have any other pictures to be featured, drop me an e-mail. Go Blue! Last year: Ross was in high school. He had 138 tackles, 13.5 tackles for loss, 3.5 sacks, 3 forced fumbles, and 1 fumble recovery. If you can't tell by the commitment post above - and the TTB Rating - I really like Ross as a prospect. He was a steady contributor throughout his high school career, seems to have a good head on his shoulders both on and off the field, and seems to be one of the more college ready prospects. Ross committed last May and never wavered at all, despite being offered by some heavy hitters from around the country. I might rank Ross higher on the list if not for the depth at weakside linebacker, his future position. Sophomore Desmond Morgan returns as the starter, redshirt freshman Antonio Poole earned praise throughout the spring (EDIT: Poole is likely out for most/all of the season due to a biceps tear), and senior Brandin Hawthorne has some starting experience, too. Despite being college ready, there's a chance that Ross will redshirt because of the depth ahead of him. It's been a few years since Michigan could redshirt elite talent, but the depth appears to be getting back to traditional levels. My guess is that Ross will see the field as a backup or special teamer, because we could quite possibly see Morgan move to MIKE in 2013, and the coaches may want to groom Ross as the starter at WILL. But with fellow freshman Joe Bolden earning praise at MIKE, too, it will be interesting to see how the depth sorts itself. Regardless of who starts, some talented kids will be biding their time on the bench. Nick Baumgardner talks about some changes that Hoke made from the previous regime, including their responsibilities in meetings and his attempts to bring them closer together as a team. Before deciding to become a Wolverine, 2012 preferred walk-on punter Kenny Allen from Fenton, MI, drew interest from some of the best programs in the country and held a scholarship offer from Oregon State. He shows off his leg strength and consistency in the videos below, which he was kind enough to share with TTB just days before heading to campus. Last year: I ranked Miller #48 and said he would be a backup tight end. He played in eight games as a special teamer and backup tight end but did not accrue any statistics. Miller has led a bit of a wandering path to this point in his career. 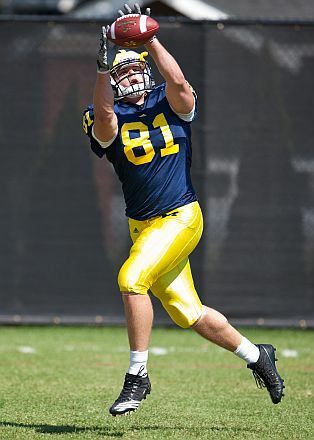 He started off as a highly touted wide receiver recruit, but when he arrived in Ann Arbor for his senior year of high school, it looked to me like he wouldn't be able to hack it at wide receiver. He tried to play at wideout as a freshman, moved to tight end as a sophomore, and now finds himself back at the wide receiver position after the spring didn't go so well. Now headed into his junior year, Miller doesn't look much closer to seeing the field with any consistency. He's too slow to stretch the field, not sudden enough to get open on short routes, too small to be an in-line blocker at tight end, and was never considered a "jump ball" type of receiver in high school. He seems to be a man without a true position. However, the need for contributors at wide receiver (and tight end) is pretty dire. The starters are average, and the backups are very young and unproven. It remains to be seen how Al Borges will use him in the offense, if at all. The BTN's Tom Dienhart interviews defensive coordinator Greg Mattison. Mattison hints that the defense will be better able to make adjustments prior to the snap now that they have a year of experience in the system. That could lead to more confusion . . . hopefully for opposing offenses. Last year: I did not rank Kwiatkowski. He played in two games but did not accrue any stats. Kwiatkowski didn't play much last season and didn't start playing football in college until last year. However, from what I have seen in practice and film, I think Kwiatkowski could be a surprise contributor this season. He's big enough to be a blocking tight end when the offense uses multiple tight end sets, and he's even athletic enough to catch a pass here or there. I don't expect him to start or turn into a star, but he could be the offense's equivalent of Nathan Brink. Here's the second part of Maize 'n' Brew's recruiting roundtable, in which I predict things and hope everyone else gets them horribly wrong so I will win the $1 million prize. Keep your fingers crossed for me . Last year: Wormley was in high school. He had 66 tackles, 19 tackles for loss, 11 sacks, 1 fumble recovery, and 1 pass breakup. Wormley's reputation as a football player went through a bit of a rough patch last year. Widely regarded as an elite recruit early in his high school career, questions arose about his health and aggressiveness. Some people (including me) thought that perhaps he had suffered an injury or, worse, had lost his fire for the game. The numbers above look pretty good, but it seemed they could have been better if he had given a little more effort on the field. Wormley claims to be 270 lbs. now and he's headed for the strongside defensive end position, unless or until he outgrows the position. There has been a lot of discussion about his potential to play the 3-tech defensive tackle spot, and that seems to be a distinct possibility down the road. Strongside end is a tough position to play for a true freshman because of the technique and strength required to hold up against double teams, so Wormley should probably redshirt. After senior starter Craig Roh graduates, Wormley can battle with his classmates, Keith Heitzman, and Nathan Brink for the starting job. Matthews (NC) Butler cornerback Channing Stribling was offered at Michigan's camp on Wednesday and committed to Coach Hoke on Thursday morning. New Orleans (LA) St. Augustine running back Leonard Fournette was offered by Michigan. Fournette is a 6'0", 210 lb. 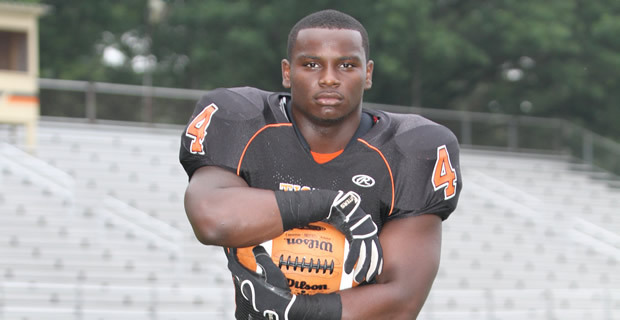 tailback with offers from Alabama, Florida, Florida State, LSU, Notre Dame, and many others. As a freshman in 2010, he had 174 carries for 1,735 yards and 22 touchdowns. La Porte (TX) La Porte linebacker Hoza Scott was offered by Michigan. At 6'2" and 205 lbs., he already holds offers from Alabama, Florida, LSU, Texas, and USC, among others. Last month he named his top five; four of them are in the SEC, and the other one is Cal. He appears to be a long shot to come to Michigan, but you can see in the highlights that the kid is a playmaker, pulling off outside linebacker plays that I normally see only in NCAA Football '12. Sherman (TX) Sherman offensive tackle Aaron Garza was offered by Michigan. Garza is a 6'4", 300 lb. lineman. San Diego (CA) Horizon wide receiver Darren Carrington committed to Oregon. He was just recently offered by Michigan and mentioned plans to attend camp but never made it to Ann Arbor. Hilliard (OH) Darby athlete Caleb Day committed to Illinois. Day didn't have a Michigan offer but camped at Michigan last week in an effort to earn one. 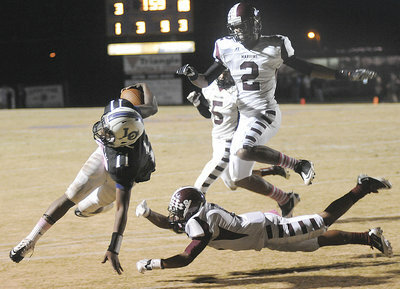 He could play several positions in college, including running back, wide receiver, cornerback, or safety. Wide receiver Sebastian LaRue committed to USC. Michigan had a shot to win over LaRue until the Trojans offered. Then it was game over. Seffner (FL) Armwood wide receiver Alvin Bailey will be visiting Michigan this week. Bailey has already been offered by Michigan and is the teammate of highly touted defensive back Leon McQuay III, who has Michigan in his top three after visiting last month. Cordova (TN) St. Benedict running back Jordan Wilkins is visiting Michigan today. He already visited Auburn and almost committed there, and he mentioned that he wants to play early. That may be difficult with all the other running backs on Michigan's roster. I have doubts about whether a visit will sway Wilkins, but at least he's coming to campus. I wrote up a scouting report on him a month ago. This is a bit late getting posted because I was out of town, but Maize 'n' Brew posted a recruiting roundup last week that featured questions with yours truly and people from Tremendous and Maize Pages, too. I would like to give myself a small pat on the back for my very first answer, where I said that one of the guys to fill out the class would have to be a sleeper cornerback. Channing Stribling was offered two days later and committed. Now we'll wait and see if I got any other questions correct . 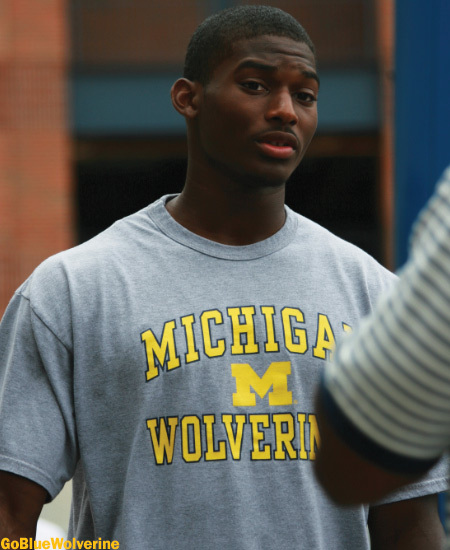 . .
Matthews (NC) Butler cornerback Channing Stribling committed to Michigan last week. He chose the Wolverines over an offer from Ball State. Stribling is a 6'2", 170 lb. cornerback and wide receiver who claims a 4.5 forty. 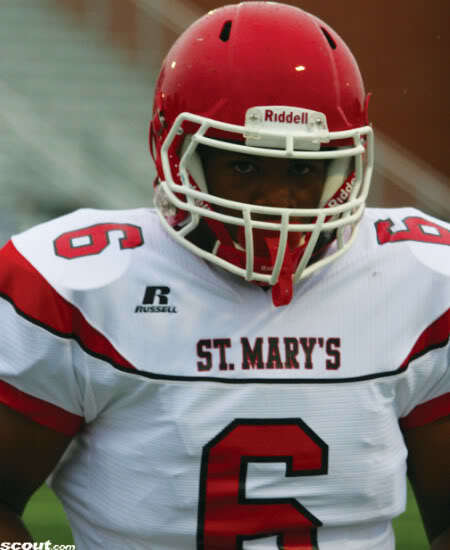 As a junior in 2011, he had 37 tackles, 14 pass breakups, and 6 interceptions. On offense he made 37 receptions for 636 yards and 8 touchdowns. Stribling is the teammate of several fellow 2013 Michigan offerees: quarterback Riley Ferguson (Tennessee), wide receiver Uriah LeMay (Georgia), and linebacker Peter Kalambayi (Stanford). Butler consistently churns out FBS talent, many of whom have been offered by Michigan in recent years. But Stribling didn't have an offer until he camped at Michigan last week, where he wowed the staff enough to earn an offer on Wednesday. He committed to Brady Hoke on Thursday morning. Stribling is a pretty physical player, especially for playing his junior season at 160 lbs. or so. He's a willing tackler who wants to come up and hit, but he gets overpowered a little bit at times. That should change as his body matures and he starts to add weight. Where he currently lacks the confidence to wrap up ball carriers and instead chooses to go low and dive at legs, he should eventually be a solid run supporter. Stribling has decent hips and ability to change direction, but his mental discipline helps him there. He seems to read plays well and recognize developing route combinations. When the ball is in the air, he shows an ability to go after it, timing his leaps well and using his length to disrupt receivers and bat the ball. As a receiver, one of Stribling's key attributes is his ability and willingness to fight for extra yardage after the catch. On the negative side, Stribling has somewhat limited speed. He doesn't accelerate extremely well and even when he gets to top speed, he won't leave opponents in the dust. His length and anticipation make up for that lack of speed at times, but in a flat-out foot race, he might not win against opposing players with elite speed. He also has some footwork and body position issues to work out, but those seem fixable. 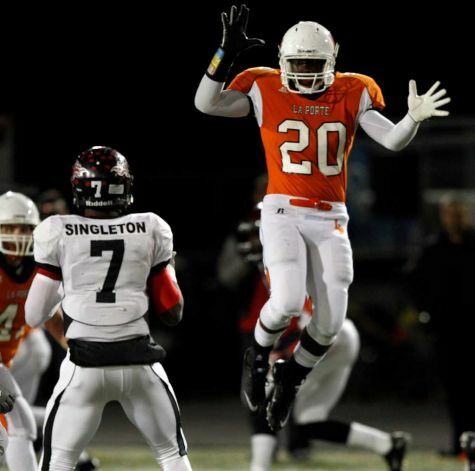 By several accounts and what I see on film, Stribling has a solid, hardworking attitude and is a competitive player. He might not be the best athlete on the field at any given time, but he should work to shore up most of the above weaknesses. His lack of elite speed and playmaking ability might prevent him from being a nationally elite player at the next level, but he has the potential to be an eventual starter at the boundary corner. When I look at Stribling, he seems like almost an exact replica of fellow 2013 cornerback commit Gareon Conley. However, Stribling seems to have a little more position flexibility and could play free safety or perhaps wide receiver if needed. 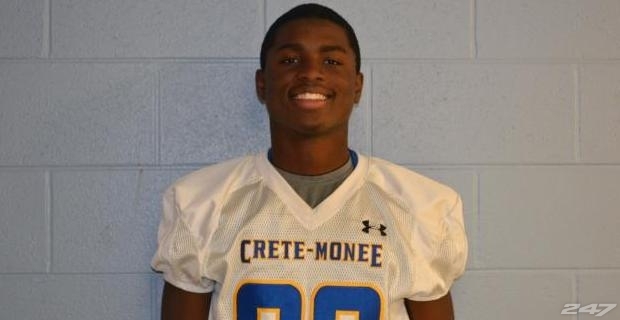 Stribling is Michigan's 22nd commit in the class of 2013, a class that is expected to reach 24 or so. Michigan wants another receiver and possibly another defensive lineman, although they will probably continue to recruit Florida defensive back Leon McQuay III. Last year: Jenkins-Stone was in high school. He had 84 tackles, 10 tackles for loss, 1 interception, 1 forced fumble, 2 fumble recoveries; 309 yards rushing, 5 touchdowns; 4 receptions, 43 yards, and 1 touchdown. Jenkins-Stone is a hulking middle linebacker prospect who should be a very imposing figure once he adds some weight. He was given some high praise early on in the recruiting process and, for whatever reason, didn't produce a great deal during his senior year. Don't get me wrong - those numbers above are very good, but they're not off the charts like many expected. There didn't seem to be a great deal of on-the-field maturation between his junior and senior seasons. Going into his freshman season, Jenkins-Stone has an uphill battle to climb for playing time. He was recruited for the MIKE position, but the starter is Kenny Demens and fellow freshman Joe Bolden enrolled early and received a lot of hype. And while the depth isn't great at MIKE, there are other options that could slide over from WILL, such as Desmond Morgan and Brandin Hawthorne. There has been some speculation that Jenkins-Stone will play SAM, and that does make sense. The only two SAMs on the roster are redshirt sophomore Jake Ryan and redshirt junior Cam Gordon; last year's other SAMs, Brennen Beyer and Jordan Paskorz, moved to defensive end and tight end, respectively. I actually like the idea of Jenkins-Stone playing SAM because he's not great at diagnosing plays, but either way, he's bound to be no higher than third string. That means he will have to make an impact on special teams or redshirt. Adam Rittenberg ranks the Big Ten's football facilities, and Michigan comes in at #3. Having never been to Ohio State or Nebraska's facilities, I can't really say whether I agree with this ranking or not. However, from what I've seen of Penn State (which was supposedly close in the running to Michigan), I don't see a comparison. Penn State has a nice workout facility and kind of a cool stadium, but Michigan is superior in almost every respect. I guess some people might prefer PSU's stadium over Michigan's if they like modernity over tradition, but that's more preference than anything. Last year: Braden was in high school. No stats are available. Braden is a mammoth offensive lineman for being an incoming freshman. At least in my memory, he's the largest scholarship offensive lineman to come to Michigan if those measurements prove accurate. Despite excellent size, Braden was mostly regarded by the recruiting services as a mediocre recruit. He's not the most technical or the most athletic lineman around. Despite some shortcomings, Braden ranks fairly high on the list for a freshman lineman because of a lack of depth. 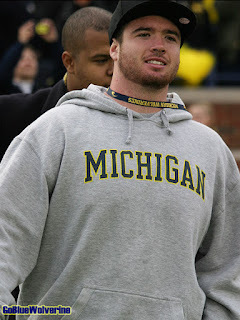 Technically, Michigan's only two non-freshman offensive tackles are their starters, Taylor Lewan and Michael Schofield. Outside of those two, options are limited to freshmen, walk-ons, or guys who are expected to play guard like Elliott Mealer and Patrick Omameh. Braden might not be any better than those walk-ons as a true freshman, but because of his size, he is perhaps the second-most likely rookie lineman to see the field. If he plays at all, expect to see him limited to the right tackle position. Tom VanHaaren interviews incoming freshman offensive lineman Erik Magnuson. Last year: I ranked Jones #33 and said he would be the backup WILL. He was a backup WILL, but he was mostly buried on the bench and made 4 total tackles. As you can see from last year's post, I am not a fan of Jones's abilities. Because of the lack of depth at linebacker, I assumed he would be in the mix for playing time, but he was beaten out by Brandin Hawthorne, Brandon Herron, and freshman Desmond Morgan, each of whom started at least one game at WILL. Jones always seems to be a step slow, which is especially a problem when you're a 224 lb. inside linebacker who's not a particularly big hitter. I've seen enough of Jones getting passed up to assume that he will once again be an end-of-the-bench guy. Herron graduated, but Morgan and Hawthorne are still around, along with redshirt freshman Antonio Poole; now freshmen Kaleb Ringer and James Ross join the fray. Middle linebacker is also a possibility for Jones, but Kenny Demens is the starter there and freshman Joe Bolden might be his primary backup. No matter where Jones gets the most reps in practice, he's likely to have a true freshman or redshirt freshman blocking his path. Special teams coverage and mop-up duty seem to be his best bets for playing time. Tom VanHaaren interviews incoming freshman offensive lineman Blake Bars. Last year: I did not rank Kerridge. He redshirted. 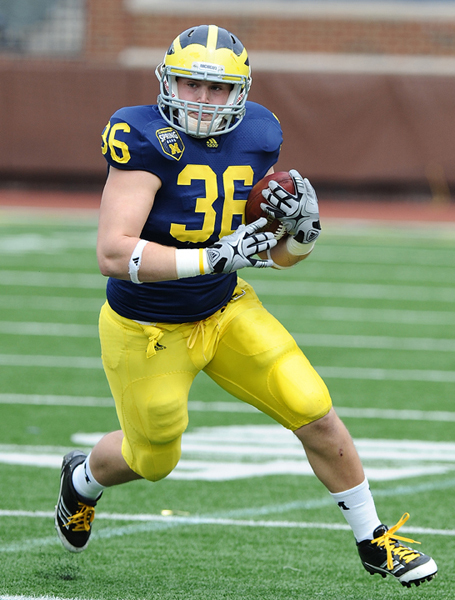 Kerridge came to Michigan as a walk-on after his senior season was derailed by an ACL tear. If not for the injury, he probably would have received a couple low-level scholarship offers. As a sophomore and junior, he had 2,200 yards rushing and scored 35 touchdowns as the team's featured running back. But after sitting out his senior season, he took last year to work his way back into football playing shape. Now presumably recovered from his ACL injury, Kerridge has a chance to nab the backup fullback job behind Stephen Hopkins. He will also be battling freshman Sione Houma, but Kerridge has Houma beat in size. The redshirt freshman seemed to play pretty well in the spring and did what a fullback should do, block and catch an occasional pass. He's not the runner that Hopkins is, but Kerridge is more of a traditional I-formation fullback. Occasional snaps should be available to spell Hopkins or mop up late in games. Tom VanHaaren interviews incoming freshman safety Allen Gant. Last year: Magnuson was in high school. He played well enough to participate in the U.S. Army All-American Bowl. Magnuson is a highly touted offensive tackle out of California, and some people even made a comparison to Jake Long. Maybe it's the fact that Magnuson wore #77, but regardless, he is a much hyped recruit. At the beginning of January, he played left guard in the U.S. Army All-American Bowl, and while he wasn't as stellar as classmate Kyle Kalis, he did look adequate with the change of position. Coming into college, Magnuson needs a fair amount of polish and he needs to get stronger. In a regular year, he would probably be a lock to redshirt. However, needs on the offensive line might mandate some playing time. He looks like a future left tackle, although that's a position with a lot of responsibility for a freshman. We might see him at right tackle or guard if the situation arises, but hopefully he can spend a year refining technique and adding mass. Jeremy Clark shed his grayshirt after a strong senior season. As a medium-sized city, Ann Arbor can be viewed as either a thriving urban area or a small college town, depending on perspective. In the case of incoming freshman free safety Jeremy Clark, it's clearly the former. Jeremy is moving to Ann Arbor from Madisonville, Kentucky, a small, isolated town with a population of less than 20,000 people. Daily fishing trips, eating at Long John Silver's and enjoying the outdoors are among his favorite activities, and although Jeremy has seen his fair share of states and cities due to his father being in the army, he recognizes that living in Ann Arbor will be quite a change after spending the past few years in Madisonville. "It's a real small town, like a ghost town almost," he said. "It's different [from Ann Arbor]." But Jeremy is less concerned with acclimating himself to a new city than he is about making an impact on the football field. He recently took some time out of a summer afternoon to talk football and answer several reader questions. Choosing Michigan: "I like to win. So out of all of my offers, Michigan was winning the most. I sure didn't want to go to a losing team. . . .When I went on that visit, they made me feel very comfortable, so as soon as I went on that visit I felt like, 'Yeah, I belong here.' I was hearing from Florida, Villanovia, Kentucky, Illinois, Cincinnati and NC State; those were the major ones. Everything else was from - uh, I forget the name of the little conference - oh, the MAC. But once I committed to Michigan a lot of the schools started backing off. . . .The schools that offered me were NC State, Illinois, Cincinnati, Ohio - not Ohio State, just Ohio - Western Michigan, Western Kentucky and I can't really remember the rest of them." Playing safety, maybe wide receiver: "When I went down for there camp, they tried to use me down in the box, and it wasn't really working all that well, so I guess they see me as more of a ballhawking safety. . . .There were other schools that wanted me to play linebacker, but I wanted to stay in the secondary, so Michigan told me I could stay back there, and that's one of the reasons that I committed to them. . . .No, they never talked to me about that [playing wide receiver], but I'd be willing to play there if they needed me there. . . .When I was playing wide receiver in High School, all my routes were basically go routes. I was faster and taller than everybody, so I'd just go straight and the quarterback would just lob it to me. . . .If they wanted to try me out at wide receiver, I wouldn't mind it." Strengths and weaknesses: "I need to work on flipping my hips and my feet work. But then my strength is that I'm fast, so I have make-up speed. And I'm 6'4''." Taking off the grayshirt: "When they first offered - like you said they'd have to grayshirt me - I was just happy to be able to go to Michigan. Then I started thinking, 'I want to get out there and play now; I don't want to do the grayshirt.' But then they said that it depends on how good of a senior year I have. And I had a good senior year. I had a good senior year so then they took it away, and that was very, very good." Chantel Jennings interviews incoming freshman running back Drake Johnson. Last year: I ranked Wilkins #57 and said he would be the third string SDE. He did not see game action. 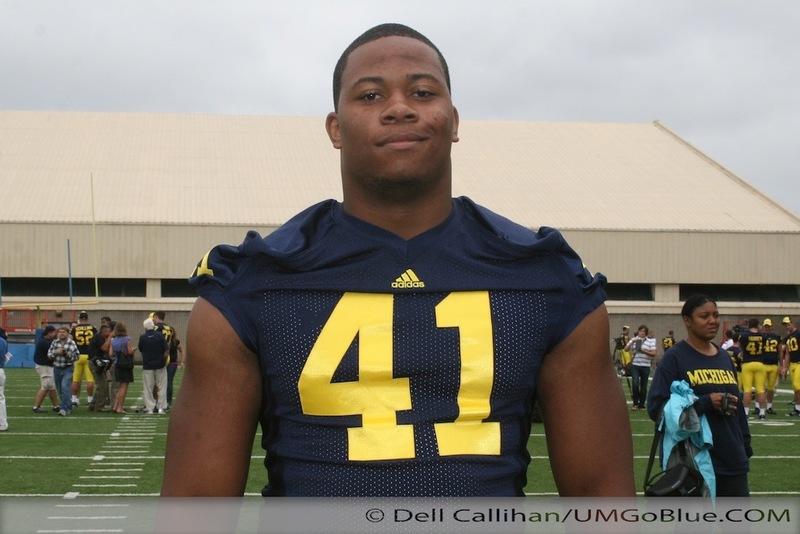 Wilkins has had an interesting journey at Michigan so far, and he's only a redshirt sophomore. He was recruited as a defensive end/outside linebacker hybrid, arrived on campus planning to play defensive end, and has now grown into a 280-plus pound defensive tackle. Rumors from practices suggested that Wilkins just didn't show the aggressiveness and work ethic to earn playing time, but putting on 30-40 lbs. in a year or two can do that to a guy sometimes. This spring the talk was a little more positive, as the light was rumored to have flipped on for Wilkins a little bit. I won't buy it until I see it, but there's an obvious need on the interior of the defensive line for someone to step up. Perhaps Wilkins sees the opportunity for playing time and has decided to make a run at a starting job. Wilkins played both nose tackle and defensive tackle in the spring. I think he's too short on technique and size to play the nose once the season rolls around, but he could be in the mix as a 3-tech. He's probably not in any danger of starting, though. Chris Brown runs through some variations on running a reverse (or end around), using Auburn, Oklahoma State, and West Virginia as examples. Last year: Godin was in high school. He had 90 tackles, 16.5 tackles for loss, and 8.5 sacks. Godin committed to Michigan last May after being publicly disappointed about not getting offered earlier. The coaches saw his 6'6" frame, now up to 273 lbs., and thought he would fit in well as a strongside end. 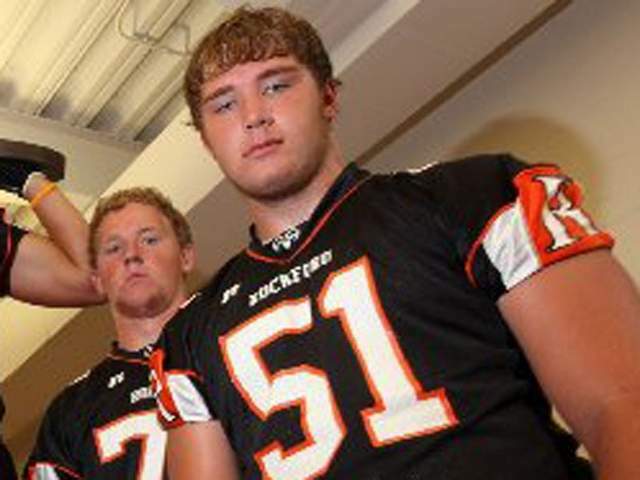 Godin's recruitment paid off in another way by helping to garner a commitment from 2013 running back Wyatt Shallman, Godin's teammate at Catholic Central; and it almost helped land Danny O'Brien, a defensive tackle from Flint who ultimately signed with Tennessee. 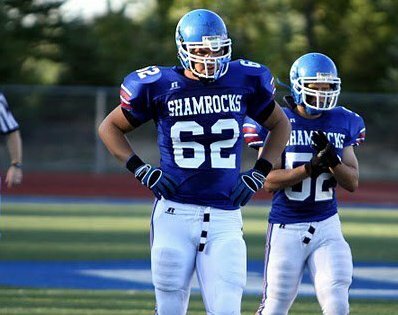 Godin played both ways at times for the Shamrocks, playing as both an offensive tackle and defensive lineman. Going into his freshman campaign, Godin should be near ready in regard to his size. He's expected to play strongside end, and senior starter Craig Roh is expected to have about 280 lbs. on his 6'5" frame by the time the season begins. Roh is a technician, however, and Godin needs to work on that aspect of his game. He has a chance to see the field because of a lack of depth at the strongside end position. Last year's starter, Ryan Van Bergen, graduated and Roh is moving from the weak side. Meanwhile, Godin will have to contend with fellow freshmen Tom Strobel and Chris Wormley, as well as walk-on Nathan Brink and redshirt freshman Keith Heitzman. It seems likely that Godin will eventually grow into a 3-technique defensive tackle, but in the meantime, the battle for the backup strongside end will be interesting to watch. Mitch Sherman provides some data on how much various teams spent on recruiting over the past couple years. 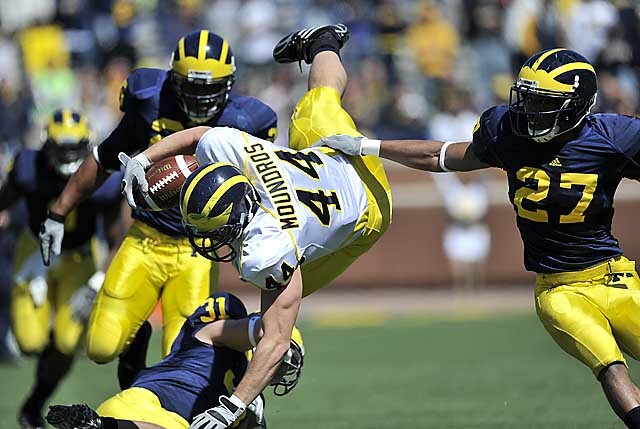 Michigan spent roughly $489,000 in 2010 and $577,000 in 2011. The Wolverines are fairly high on the list, but nowhere near the Tennessee Volunteers, who spent almost $1.5 million in 2011. Yowzers. Last year: Richardson was in high school. He made 49 tackles and 7 pass breakups; he also had 24 receptions for 425 yards (17.7 yards per catch) and 2 touchdowns, plus 1 kickoff return touchdown. Richardson had a terrific junior season as teams threw away from Delonte Hollowell (now a sophomore at Michigan) and into the arms of Richardson, who had 9 interceptions that year. His production really fell off as a senior, although he still broke up 7 passes and made an impact on offense and special teams. Richardson nabbed offers from all over the country and flirted with visiting other schools, but eventually stuck to his Michigan commitment. Heading into his freshman season, Richardson appears to be a little light at only 163 lbs. Michigan returns both starting cornerbacks in J.T. Floyd and Blake Countess, with slot corner Courtney Avery, spring upstart Terrence Talbott, and backup Raymon Taylor also in the mix. It seems unlikely that Richardson's services will be needed this season, and while he could help out returning punts and kicks in the future, the Wolverines have some players to do those things already on the roster, not to mention fellow incoming freshman Dennis Norfleet, who is being brought in specifically to fill those duties. If everyone stays healthy, Richardson should be able to redshirt this season and fight for playing time in 2013. Chicago (IL) De La Salle offensive guard Jamarco Jones was offered by Michigan on his visit to campus. He's a 6'5", 285 lb. prospect with offers from Illinois, Ohio State, and Vanderbilt. He plays left tackle for De La Salle, but his body type and pulling ability suggest more of a future at guard than tackle. I really like his athleticism, strength, and mentality. 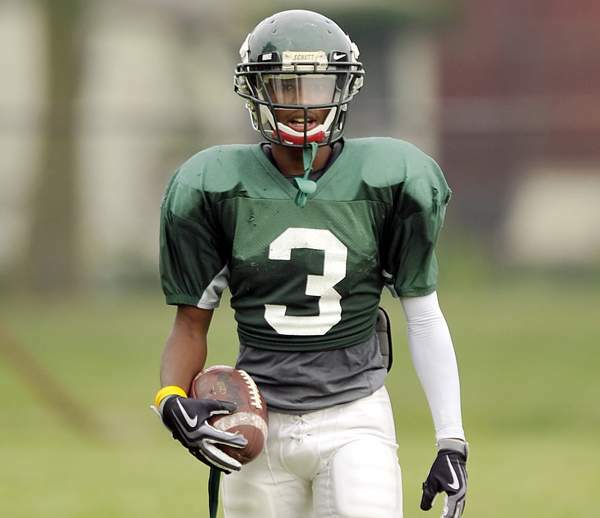 Detroit (MI) Cass Tech cornerback Damon Webb received a Michigan offer on Thursday. The 5'11", 170 lb. 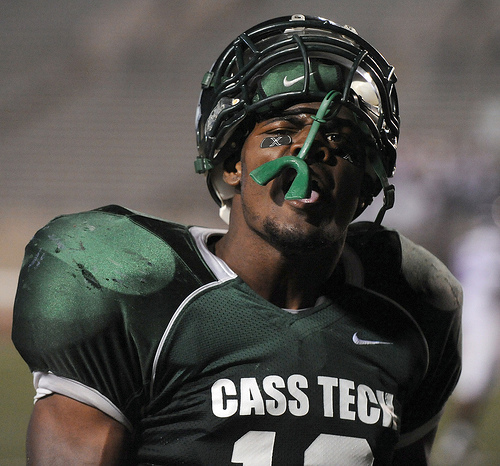 Webb transferred to Cass Tech this offseason and will play for the Technicians for the first time this fall. Similarly to future teammate Jourdan Lewis, it appears Webb could play either cornerback or receiver in college. The Wolverines want him for defense. Somerville (NJ) Immaculata defensive end Tashawn Bower committed to Auburn. He said not long ago that he would visit Michigan this summer, but when he made his commitment, he said he was shutting down his recruitment and that he was 100%. You never know in recruiting, but it looks like that visit might not happen. Avon (IN) Avon defensive end Elijah Daniel committed to Clemson. Daniel never strongly considered Michigan and always seemed to want to head south. Clemson just picked up defensive end Robert Nkemdiche, who is considered by some to be 2013's top overall prospect, last week. If you go to Clemson, you might not win many games . . . but it does give you a good chance to get to the NFL. Oakland (CA) Freedom wide receiver Darrell Daniels committed to Washington. Some people were surprised that Daniels picked the Huskies over USC, but those were his two leaders for a while. Daniels expressed early interest in seeing Michigan, but it never seemed like a serious flirtation. Matthews (NC) Butler quarterback Riley Ferguson committed to Tennessee. Michigan already has its 2013 quarterback in Shane Morris, but Ferguson was one of only three guys that the Wolverines offered in the process. Michigan's staffs have gone after Butler hard in recent years, trying to reel in guys like linebacker Kris Frost, linebacker Peter Kalambayi, and both Christian and Uriah LeMay; however, the coaches have struck out ever since they got Jamar Adams back in 2004. 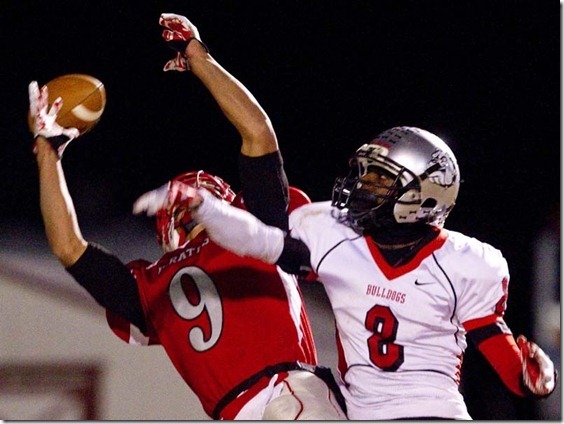 Akron (OH) Firestone wide receiver Kevin Gladney committed to Nebraska. Michigan was pursuing him early and it was rumored that Gladney was close to committing, but that buzz went away and so did Michigan's recruitment of him. He was originally reported to be 6'3" or 6'4", but it turned out that he's only 6'1". Gladney's not particularly fast or elusive, and Michigan needs a playmaker as its third wide receiver, anyway, so it wouldn't have been a great match. Washington (DC) Friendship Collegiate Academy inside linebacker Yannick Ngakoue committed to Maryland. He was offered just prior to Michigan filling up on linebackers, so it doesn't seem like Michigan got too far into the process of going after him. Regardless, Ngakoue appeared to want to stay close to home, he has a couple classmates committed to the Terps, and Randy Edsall is doing a nice job of recruiting since coming over from UConn. Friendship Collegiate Academy has been churning out some quality talent in the last few classes (such as DT Eddie Goldman in 2012), so it's good to try to develop a relationship there. Here's a look at some of the kids who are camping at Michigan this week. Michael Rothstein interviews incoming freshman defensive end Mario Ojemudia. Wheaton (IL) St. Francis OT Kyle Bosch: No stats available. 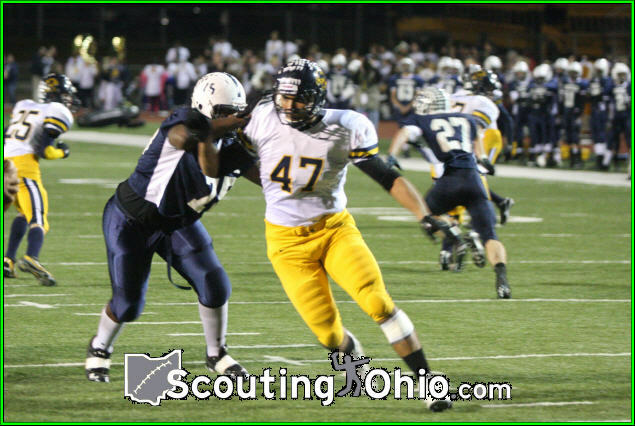 Pickerington (OH) Central DE Taco Charlton: No stats available. Detroit (MI) Cass Tech OG David Dawson: No stats available. Parker (CO) Ponderosa OT Chris Fox: No stats available. Wexford (PA) North Allegheny OG Patrick Kugler: No stats available. 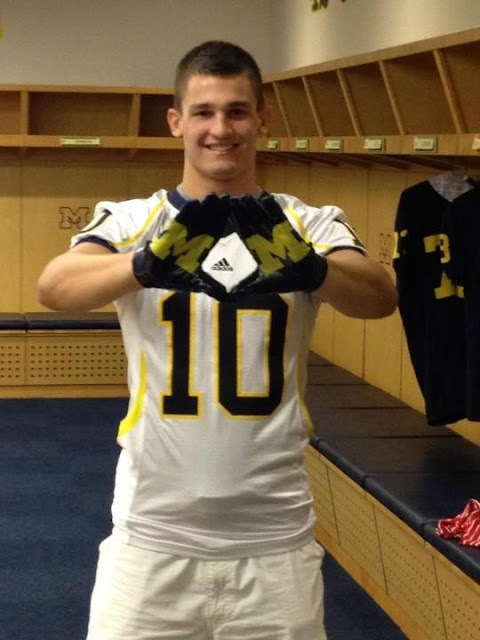 Novi (MI) Catholic Central RB Wyatt Shallman: No stats available. Ottawa (IL) Marquette LS Scott Sypniewski: No stats available. Peoria (IL) Manual OT Logan Tuley-Tillman: No stats available. Last year: I ranked Gunderson #67 and said he would be a backup offensive tackle. He played in four games as a backup lineman. Gunderson came to Michigan as a 6'8", 338-pounder and slimmed down significantly under Rich Rodriguez, since Rodriguez was into cardio and athleticism for his linemen. Under Brady Hoke, Gunderson is slowly putting on weight once again and is up over 300 lbs., fourteen pounds heavier than last year. He played in several games last season, but did not see action in crucial situations. Offensive tackle is once again a thin position now that Mark Huyge graduated and only freshmen are left outside of starters Taylor Lewan and Michael Schofield. Gunderson could be a key backup if the freshmen struggle to adjust and if there are injuries along the offensive line. He's a little slow-footed and would most likely work in at right tackle if needed, but he's an adequate run blocker. No offense to Gunderson, but let's hope that he's not needed this season. Michael Rothstein interviews incoming freshman defensive tackle Willie Henry.